Even though its our last day at camp, we still have a full day ahead! Laser tag, swimming and outdoor games await! Its the last night of camp, so what better way to celebrate a great week than with a late night dance party. Counselors surprised kids with glow sticks, fun music and a midnight dance party! Tonight was a very special night, as the presence of God was felt around the campfire. First, kids separated into gender/age segregated groups to discuss the meaning of communion after a time of worship. Then, everyone rejoined around the campfire and explained the meaning of communion in their own words, ending with the 8th graders leading the younger campers in prayer. 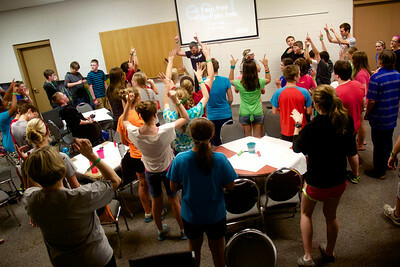 Campers and counselors gave personal testimonies about what communion means to them and the freedom they have in Christ. Pastor Perry led students to commit or recommit their lives to Christ and finished with offering communion to the group. [! [_MG_8411](http://res.cloudinary.com/impact-2818/image/upload/h_682,w_1024/v1423286090/MG_8411_rrpjqs.jpg)](http://res.cloudinary.com/impact-2818/image/upload/v1423286090/MG_8411_rrpjqs.jpg)Campers enjoying the pool and pretending to be “unicorns” wherever they go this week. Today campers are looking into Solomon’s story. Kids will study wisdom and how it is a gift from the Lord. Be praying for campers today as they seek wisdom from the Lord! Tonight campers had a special treat, smore’s and worship around the campfire! After getting cleaned up from messy games, kids enjoyed worship outside and heard as one of their counselors told her story of bravery. Today’s spiritual theme focused on bravery. Earlier, kids learned about David’s bravery when he killed Goliath. Campers talked about the giants in their own lives, knowing who was really fighting their battles for them. In tonight’s family group devotional, campers are looking at death and the afterlife. Kids discuss their greatest fears with group members and one of humanities greatest fears, death. Looking at Jesus’s life after his resurrection, students learned that a physical death is not the end and that through Jesus, God defeated the power of death on the cross. Romans 8:38-39 and 2 Timothy 1:9-10 both declare God’s promise that his love always wins over death, so we can be walk in the freedom of God’s grace and do not have to fear, even death! Jesus is here, and is using these awesome counselors to love on your kids! Good Morning parents! We are so excited about another great day at camp! The rain is gone and today we are looking forward to using the pool and high swings. During family time, students will hear study Jesus’s life after he was resurrected. Kids will look at the eternal life Jesus posses and begin to discuss what eternal life looks like in their own lives. After a fun time singing praises to Jesus, students wrapped up the day hearing about Joseph and looked at his example of resisting temptation. How great is it to know that God gives us the ability to say no to sin! During family time today, students looked at temptation and how it effects their lives. Counselors discussed how sin is different from temptation, and explained that even Jesus was tempted. Students looked at examples of lies from how the world views temptation and the excuses that people give young people to fall into sin. Finally students looked at what the Bible has to say about being tempted and the power that they have in Christ to overcome anything. All this week kids are learning about** taking risks**. This morning campers looked at Moses’s sister Miriam. She risked her life for his safety, and God ended up using him to free an entire nation. Her bravery and faith in the Lord led to the freedom of God’s people. God has a purpose for your life. Don’t be afraid to take the risk. Well the rain finally quit so campers enjoyed fun games and family outdoors before worship. It was a messy game of capture the flag out in the muddy field, but we had an awesome time! How Willing are You to Take Risks? This was the question campers were challenged with in their afternoon devotions and within family groups. What have you risked and what are you willing to risk for the Kingdom? Looks like our afternoon activities like swimming and outdoor games will have to be postponed. Not to worry, our campers are enjoying indoor games and an afternoon devotional activity. This morning campers were challenged to take risks. After a short message, they spent time creatively expressing different forms of risk taking. Some drew pictures, others painted, one even build a clay model of a tight rope walker. some of the pictures included, sharks, big explosions and super hero stunts. Although campers will most likely never encounter those scenarios in real life, they did get a chance to take big risks during morning activities.